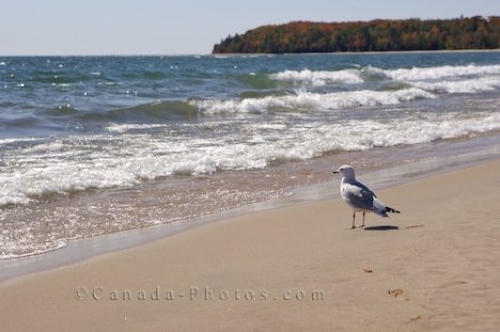 A single seagull stands along the beach at Pancake Bay along Lake Superior in Ontario taking in the scenery. As Lake Superior shows a little fury, the waves roll in along the beach at Pancake Bay where a lonely seagull takes a rest and enjoys the scenery. Along the shoreline, the colorful Autumn trees tower above the beach where no other life seems to exist except for this one seagull. Seagulls on the beach at Pancake Bay in Pancake Bay Provincial Park, Lake Superior, Great Lakes, Ontario, Canada. Picture of a seagull on the beach looking out over Lake Superior from Pancake Bay Provincial Park in Ontario, Canada.